"Get ready! 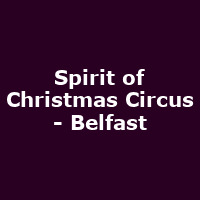 The countdown has started to the fun-packed festive magic of BELFAST - SPIRIT OF CHRISTMAS. The heart of the city will pulsate to the yuletide merriment of traditional vintage fairground rides...a skating rink of real shimmering ice...Victorian side shows... retail therapy... delicious fresh food and seasonal treats'and to top it off - a spectacular Big Top show - Jack Frost's Christmas Circus"